I went out last week with my friend, Courtney, to celebrate her 30th birthday. We had a special night eating at a cute, new restaurant, talking for hours and hours, and of course, taking outfit pictures. Courtney and I have been friends since orientation of our freshmen year at East Carolina University. She was a theatre major, I was a dance major, and somehow we ended up being in the same orientation tour group. She was wearing a Young Women's Girl's Camp tshirt, and after introducing ourselves, we became instant friends. Our meeting was definitely not a coincidence, because not only do we still have so much fun together, she is the person that introduced me to Noel. Courtney, the fabulous! Also, as a side note....these pants. Major two thumbs up. 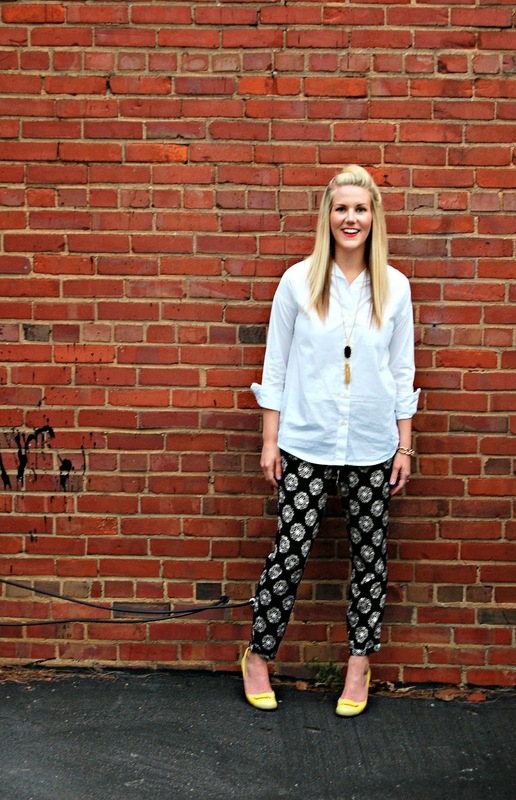 Agreed: MAJOR thumbs up to those pants! As soon as I saw your first picture I thought, "Those pants have got to be Old Navy." ON is so on it for spring! I've been in the store maybe too many times recently... oops! You are looking great (as always!). You look adorable, mama;) I met my bestie on the first day of my freshman year, and I have been so grateful for that. She is the best! Glad you got to get out and catch up! Umm that first photo is perfection. Should literally be an ad for like Banana Republic or something. I'm glad you got to hang with your friend!! How cool she introduced you and Noel?! You are seriously one hot momma!! Love the pants! And a night out with your girl friend sounds just perfect!! girl's nights out are always so fun! I LOVE the shoes! You look beautiful, Ashley! Those pants are awesome and so fun :) Glad you got some friend time in- nothing better than those long dinners/nights of catching up! 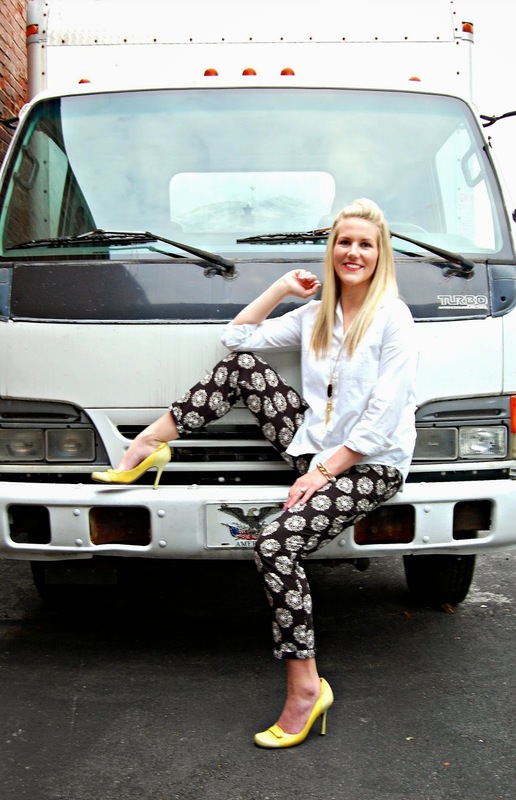 I love those patterned pants, and how you paired it with a pop of yellow, and a bold lip! Adorable! Totally a great outfit for celebrations! We recently just moved 10 minutes away from one of my roommates from when I went to LDS Business College and I'm convinced that there are never coincidences like that! It's so fun to have life long (amazing) college friends! Cute story! I love those friends that you know will have a really special place in your heart forever. Oh and you look gorg (obvi). Love girlfriends like that-they are priceless! And these pants deserve a major MAJOR two thumbs up! Between these pants and those shoes. A million thumbs up for this outfit.